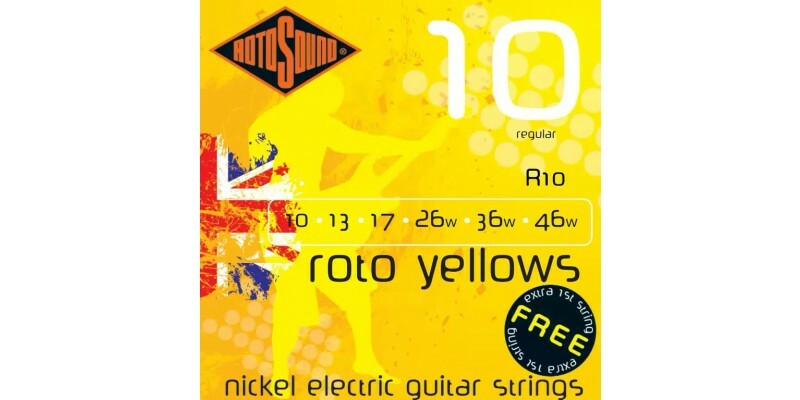 Rotosound Roto Yellows Regular Nickel On Steel electric guitar strings are made in the UK. The kind people at Rotosound also include a free extra first string in each pack. Developed in conjunction with some of the worlds top artists, these unique sets deliver a smooth powerful tone that lasts while other strings have long gone dead. Superb brilliance and strength make Roto's the first choice for the professional. Available in all the popular gauges, 12 string sets, 7 string sets and custom made singles for the discerning tone-head!